[Press Release] Fort Collins, Colo. – On November 16, 2009, just in time for the Thanksgiving holiday, Odell Brewing will release Woodcut No. 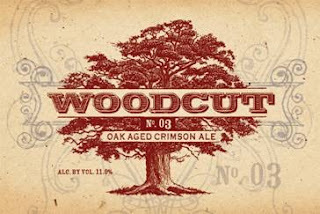 3, Oak Aged Crimson Ale, the third offering in the brewery’s Woodcut series of beers. Each Woodcut offering is a limited-edition beer crafted with select hops and malted barley. After primary fermentation, the beer is chilled and then transferred to virgin American oak barrels for aging. As the beer ages, the wood imparts unique and complex flavors. Brewers evaluate various barrel blends, carefully selecting the blend to bottle. Woodcut ales are then bottled conditioned in 750ml champagne-style bottles with a cork and cage finish. For Woodcut No. 3, brewers artfully combined Crystal, Cara, and Munich malts to create a pleasant sweetness and an appealing red color. Hints of caramel, raisin, and toasted almonds are balanced by delicate hop flavors, and the beer’s distinct oak aroma enhances the finish. Woodcut No. 3 is a perfect pairing for the traditional Thanksgiving dinner. Odell Brewing will give thanks and celebrate the release of Woodcut No. 3 with an un-corking celebration at the brewery’s tap room on November 16th from 4 – 6 p.m. Beer enthusiasts can enjoy samples of the beer paired with an array of artisan cheeses and chocolates. A limited quantity of numbered bottles will also be available for purchase. Odell Brewing was recently named a “Best Company to Work For” in Colorado and is an award winning brewery, nationally and internationally: 2009 Stockholm Beer and Whiskey Festival – silver medal for 5 Barrel Pale Ale, bronze medal for 90 Shilling. 2008 North American Beer Awards – gold medal for 5 Barrel Pale Ale. 2008 World Beer Cup® – gold medal for IPA, silver medal for Double Pilsner, silver medal for Cutthroat Porter. 2007 Great American Beer Festival® – gold medal for IPA, silver medal for Easy Street Wheat, bronze medal for Extra Special Red. 2007 Australian International Beer Awards – silver medal for 90 Shilling, silver medal for Cutthroat Porter, silver medal for Easy Street Wheat and bronze medal for 5 Barrel Pale Ale. - Odell expansion moving along - Woodcut No 3 announced. - Odell Brewing gets a new web site. - Odell Brewing controls Mountain Standard time.